Unlike SNAP, the CTC is not primarily targeted at low-income families. In fact, as I describe in the next section, very low-income families are either excluded from the credit completely or receive a reduced credit. Instead, the CTC is a broad-based credit available to families earning at least $3,000, and begins to phase out for incomes over $110,000. Of all taxpayers, around 22 percent receive the credit, but for most income groups, around one-quarter receive it. Figure 1 shows the percentage of taxpayers in each income category receiving the CTC. For taxpayers with annual incomes of $3,000 or less, no credit is available.6 Above $3,000 of income, the CTC is phased in at a rate of 15 percent. The basic credit is limited by the amount of the taxpayer’s tax liability, but there is also a refundable portion of the credit, limited to 15 percent of the taxpayer’s income above $3,000. Thus, for a family with one qualifying child, the $1,000 credit is fully phased in at $10,000 of income. For a family with two children, the $2,000 credit is fully phased in at $16,400 of income. The credit begins to phase out over $110,000 for married joint filers ($75,000 for head of household) at a rate of 5 percent, meaning that $50 of the credit is lost for every additional $1,000 in income. For a married couple with two children, the credit goes to zero once they reach an annual income of $150,000. of $50,000, there is essentially no tax benefit beyond seven children. For a family with $25,000 in income, the fourth child only adds a $300 credit, and there is no tax benefit beyond the fourth child. 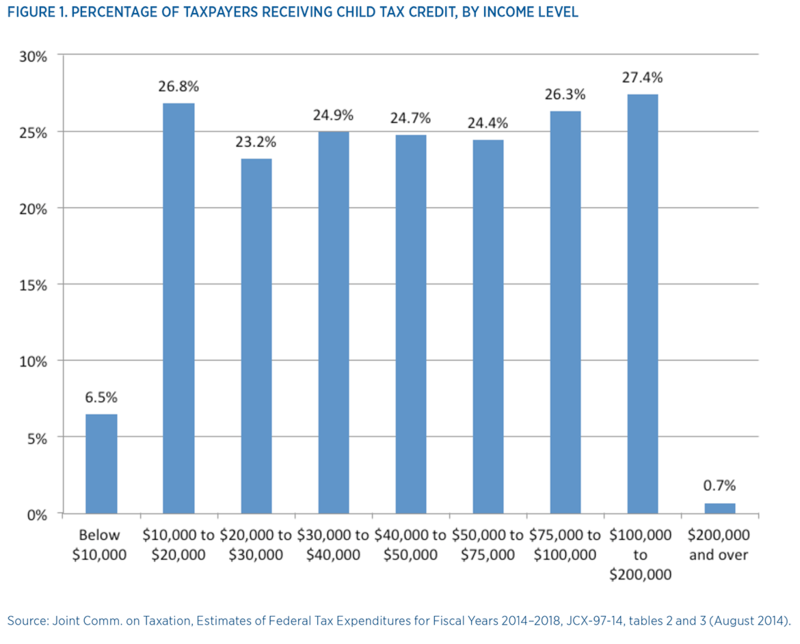 IS THE CHILD TAX CREDIT JUSTIFIED? The CTC is clearly a benefit to a large number of working families, so removing the credit without some offsetting decrease in tax rates would likely be politically unpopular. But is the credit justified as a matter of public policy? The tax code already has a number of provisions that lower the tax burden on families with children. Instead, subsidizing children through the tax code is only economically justified if an increase in children leads to external benefits to society. This is the second justification offered for lowering the tax burden for families. In order to justify lowering the burden for families, these external benefits to society must be large enough relative to the private benefits that families would gain from their choice of having fewer children.9 For example, children will eventually contribute to Social Security, which is a benefit that is available whether one has children or not. The contributions of these children to a program that benefits even those without children might justify tax subsidies that encourage families to have children. It is extremely difficult, perhaps impossible, to measure whether families are having the “right” number of children from a social perspective. But it is much easier to show that the US federal tax code has greatly expanded the subsidy to families with children since the CTC was introduced. Table 1 shows the percent of income paid in federal income taxes in 1997 and 2013 for three different income levels and filing statuses, and for different numbers of children. First, in both years and for all three family incomes, there is a tax subsidy for having more children. But the table also shows that the tax subsidy is much bigger in 2013 than in 1997, the last tax year before the availability of the CTC. The first family in the table, a married couple earning the median household income, saved about 1 percentage point of their income in the form of lower taxes per child in 1997 (more concretely, just under $400). In 2013, the savings per child jumped to over 3 percentage points, or almost $1,600. Of this amount, $1,000 is due to the CTC, which is most of the $1,200 difference in nominal terms (and virtu- ally the entire difference in real terms, as $400 in 1997 is worth almost $600 in 2013). For the other two family types shown in the table, the tax subsidy for children grew even larger in percentage point terms between 1997 and 2013, as these families also qualify for the EITC. The CTC provides a significant subsidy to almost all tax- paying families with children, and the US federal and local tax codes contain many other provisions that subsidize child rearing. In the aggregate, the CTC subsidy to families with children has grown to nearly $60 billion, placing it among the list of the largest “tax expenditures” as defined by Congress’s Joint Committee on Taxation. This is a topic that requires much more scrutiny, primarily to determine if, given other policies subsidizing child rearing, there is a social need for $1,000 more per child. One alternative is to remove the subsidy and lower tax rates by an offsetting amount. This tax cut would benefit all taxpayers, not just parents. It would also provide social benefits in terms of increased productivity and economic growth, and this is the most relevant comparison to any social benefits from additional children.